A photo depicting North Korean workers digging a trench and planting trees in a section of its border which separates the country from South Korea appeared on the web after a North Korean soldier escaped earlier last week. A group of senior US diplomats residing in Seoul paid a visit to the Joint Security Area on November 23, where they saw five North Korean workers digging a deep trench in that area, a member of the diplomatic delegation told Reuters. “The workers were being watched very closely by the KPA guards, not just the two in the photo, but others out of shot behind the building,” said the diplomat, who wanted to stay anonymous. ​It seems that North Korea is fortifying its borders now. According to an intelligence official cited by South Korea’s Yonhap news agency, the North has replaced the 35-40 soldiers it had guarding the Joint Security Area at the time of the incident. “We’re closely monitoring the North Korean military’s movement in the JSA,” a South Korean defense ministry official told reporters. “There are limits as to what we can say about things we know,” he added. 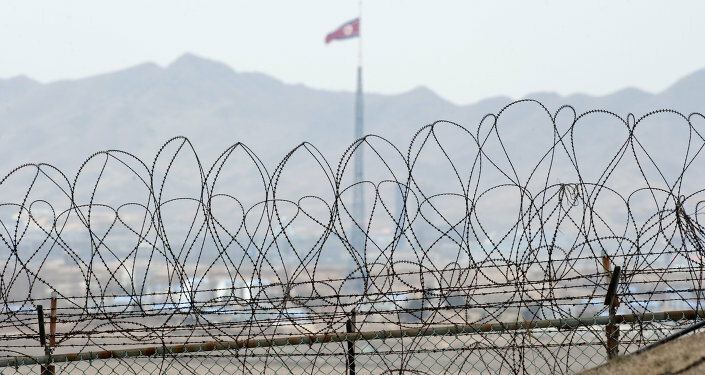 The defection incident occurred on Monday, November 13, when a North Korean soldier fled to South Korea across the Joint Security Area of the demilitarized zone which separates the two countries. The soldier was fleeing in a jeep but had to ditch the vehicle and continue the last leg of his escape on foot while being fired at by North Korean servicemen. He sustained five gunshot wounds and was airlifted to Ajou University Medical Center south of Seoul in critical condition. ​Meanwhile, Pyongyang has not commented on the defection of its soldier. The young soldier, who is only known by his family name Oh, is in stable condition despite sustaining multiple injuries from five gunshot wounds to his arm and torso.